This scene depicts a New Year’s play where children are wearing costumes of the Seven Gods of Fortune who are believed to bring seven happinesses. They are on a Takara-bune (lucky Treasure Ship bringing wealth in the New Year) with the head of a geki (an imaginary bird with white wings) and with the character 'kotobuki' (long life and congratulations) on the sail. Each of the children carries one of the emblems of the Seven Gods, including the youngest child being breast-fed who has the mallet of Daikokuten. The ship is drawn by six women. The combination of the Seven Gods of Good Fortune and Takara-bune was a popular theme for the New Year. In the Edo period, prints with this motif were sold at the end of the year as well as during the New Year. People hoped to have a good hatsuyume (first dream of the year) and expectations of happiness for the coming year, by putting Takara-bune prints under their pillow. 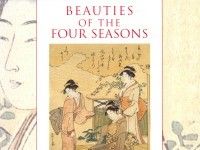 The designs of shō-chiku-bai (pine, bamboo and plum) as the symbols of felicity are on the kimono of a woman on the right (pine) and of two women on the left side of the ship (bamboo and plum respectively). According to the inscriptions by Utamaro next to his signature, the print was made as his first work of the New Year in the Ox Year (1805), the year before his death.